As mentioned before, this is a popular show, and a great deal of time and effort goes into making an enjoyable day. 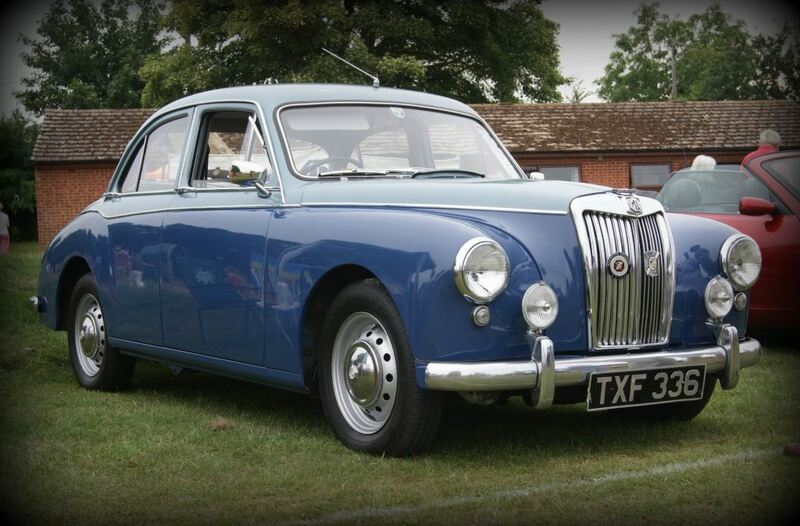 Fiona and I got there at about 12:15, and, just as we parked the trusty MG in the line of Classic vehicles on show – it started to rain, so the roof went up. When we finally braved it out of the car [frankly, we couldn’t see out of the windscreen any more anyway, and, try as we will, we can never spot the “demister” setting on the Midget’s comprehensive heater system] we spotted Di and Dave Rayner, similarly trapped inside their car by the elements. At least we’d brought coats. More than Di and Dave did. The weather perked up, though . . . and the Spitfire did indeed do a fly-past. It’s amazing how inept one can become when trying to photograph something in the sky. I have a slightly blurred shot of part of the tailplane. Steve and Gaynor were hard at work in the Prosecco tent, and the crowd did indeed increase as the day went on. Excellent day. Then it started to rain again . . .
We gave the new 'Storm Shelter' an airing at the Badsey Flower Show and it was needed to provide shade from that big yellow thing in the sky. We had a good line-up of cars but the best thing was the bacon butties cooked by Alan & Julia, a great idea. 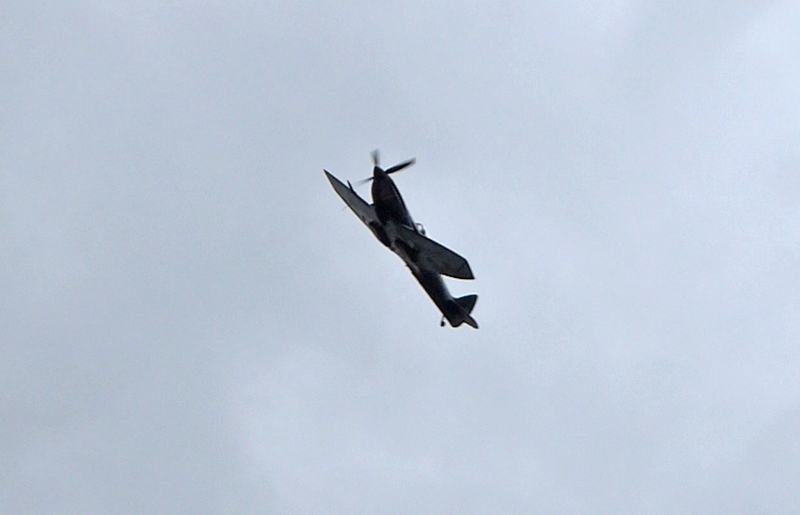 The show was good too, especially the flypast by a Spitfire from the British Memorial Flight. 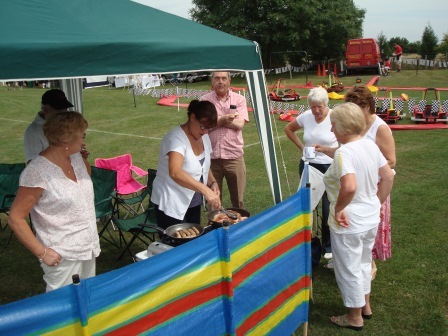 A happy band of 11 cars enjoyed the sunshine at this years Flower Show, they were no doubt encouraged to attend by the Spitfire fly past and the Bacon Rolls provided by Alan & Julia Cleobury, please note the matching aprons!! The only downside was that Merlot the puppy didn't win in the dog show - but there's always next year. Steve would like to thank everyone for turning up and creating a magnificent display. 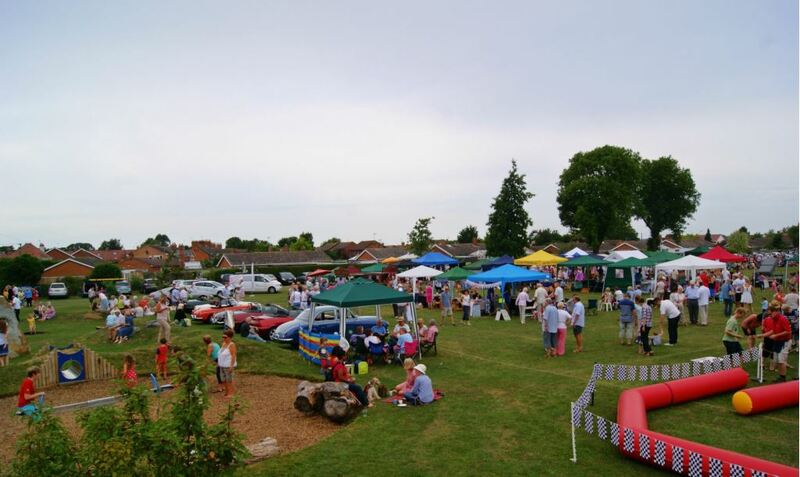 Badsey Flower Show took place on 27th July and over 2000 people attended. 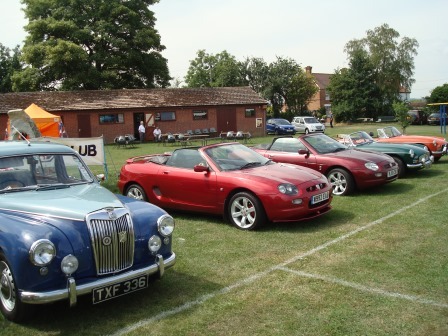 Arden MG Club were well represented and the weather and bacon sandwiches were much appreciated! Entertainment included a flypast by a Dakota from the Battle of Britain Memorial Flight, Sheepdog demonstration and the Shirley Pipe Band. 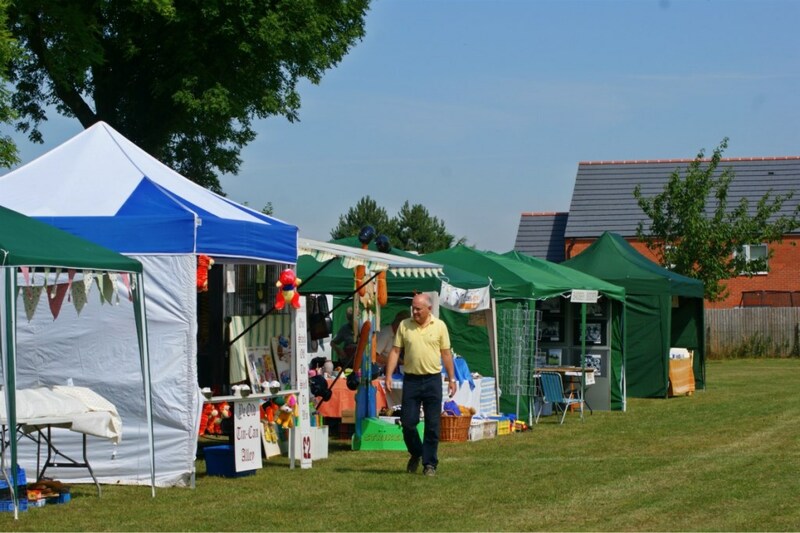 There were over 50 stalls including a horse shoeing demonstration, handicrafts, plant sales and vintage cars. Everyone who attended seemed to enjoy themselves - and hopefully will attend next year's 112th Badsey Flower Show.